Where all things are sweet! My dad engraved EVERYTHING with his California Driver’s License number. My brother and I used to say we were lucky because it was not engraved on our butts! Anyway, my dear sweet brother “borrowed” my bike, rode it to the store we were forbidden to go to, it was stolen from store, brother cold not report the theft due to self-incrimination so he concocted a story. “Someone stole your bike from the backyard where it was locked to the fence!” The unfortunate neighbor boy was blamed (behind his back) for YEARS! For probably 15 years! One night we are having Sunday dinner at my parent’s house and the REAL story is told. Flash forward another 6 years and my father receives a call from the Huntington Beach Police Dept. (He retired from the LAPD). They asked if he had a bike stolen. It took a minute for my dad to think back and he said yes, my daughter’s bike was stolen when she was 9 (I was now 30!). It turns out a lady was arrested on a Schwinn Cruiser bike and when they removed the many stuffed animals from the handle bars, what did they discover? You guessed it, my dad’s DL number! 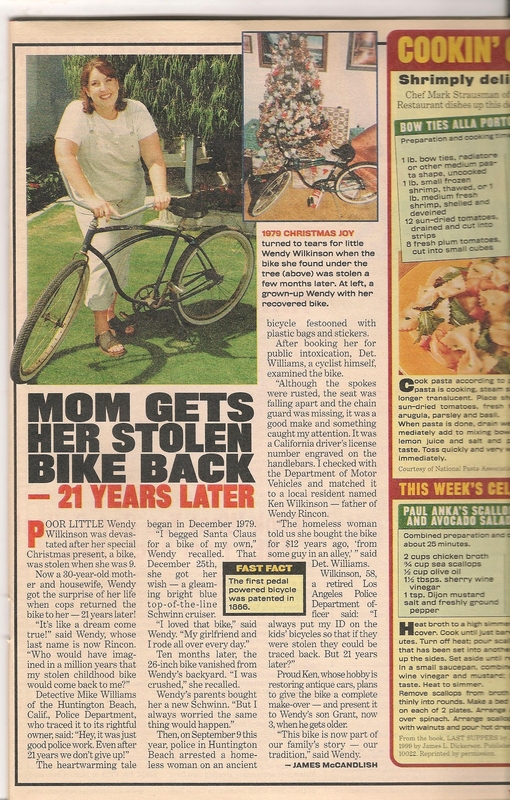 Yup, the cops found my bike 21 years later! My dad fixed restored (he would prefer that word!) up the cruiser for my son who was 3 when it was found. Grant is now just a wee bit too big for the bike, but he hasn’t been asking for a new bike yet. My daughter will be riding the bike before we know it. I just realized while I was writing this that she is now the age I was when the bike was stolen! CRAZY! I would guess there are not too many families that have a Schwinn Beach Cruiser as a family heirloom! The HBPD PR Department sent out a press release saying, “they never give up on a case!” I was bewildered by all of this attention but I was told several times that “this was a feel good story”. So you are welcome for me making you feel good! And by the way, The National Enquirer even had to add drama to my little story. “Poor little Wendy…” and “It’s like a dream come true”. I guess I did end up writing a story about the bike. You all just read it! I do have to say, there are days when I FEEL like a celebrity. For example, I am the Co-PTO President (Hi Amy, my Co-Pres!) at my daughter’s school and every time I step onto campus I have kids waving furiously at me, running up to me giving me hugs or if my daughter is around, the kids will point at me and say “Syd, your mom is HERE!”. I have even had a sweet little girl follow me around at a craft store because she “knew” me. Anyway, it’s pretty nice for a mom who is lucky if her family acknowledges her and says “Thanks for dinner!” I don’t mean to complain, but seriously, can they at least acknowledge the fact I made them dinner? Geesh! So was the cliffhanger better than finding Bobby Ewing really had not died and was only taking a shower? (Have I shown my age by referencing such an old show?) No worries! I am a child of the 70’s and 80’s and I am proud of it~Here is to being over 40! Hi! I am Wendy and welcome to Butterscotch Lady where I will share with you my love of fabulous and inexpensive home décor, projects and entertaining. I also work with clients by creating welcoming interiors, outdoor rooms and parties. I live in Huntingtobn Beach, CA with my husband and two kids. Like what you see on Butterscotch Lady? Sign up for my blog! Please email me at WRButtrsctchlady@aol.com for appointment times and pricing. Please leave a comment! Butterscotch Lady LOVES reading them! Butterscotch Lady on Round Up the Stars!